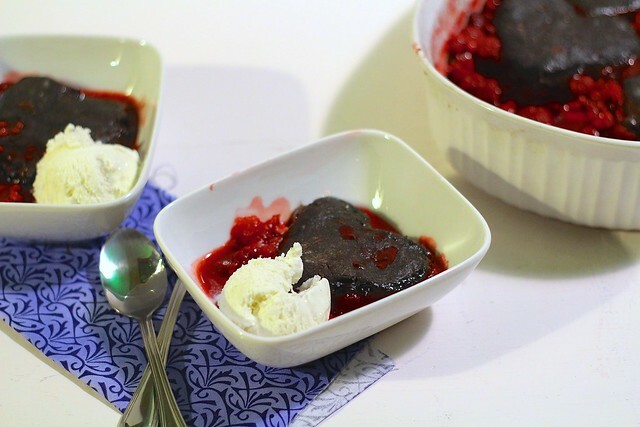 With Valentine's Day coming next weekend, we can't forget about a few dessert ideas! My husband and I tend not to celebrate the day. It's the day after his birthday, which I like to celebrate more. 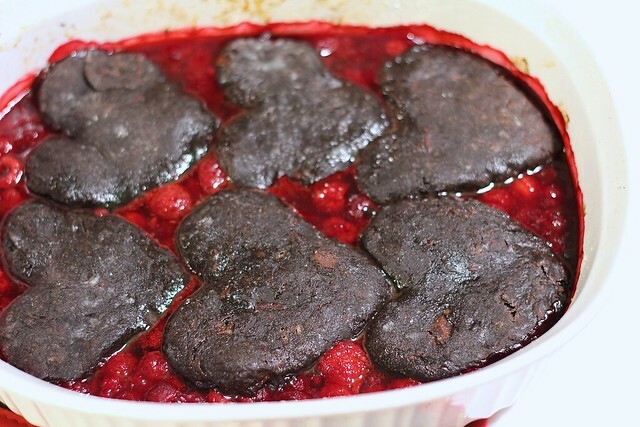 But, that doesn't mean I can't bake a few Valentine themed desserts! Hearts make everything cuter, don't you think? Chocolate and raspberries are one of my favorite combinations. Well, that and chocolate with orange. Something about that fruity taste with chocolate makes me super happy. This cobbler is no exception. The "biscuits" are super chocolatey, with the slightly sweet raspberries. Topped with vanilla ice cream and we are in business! 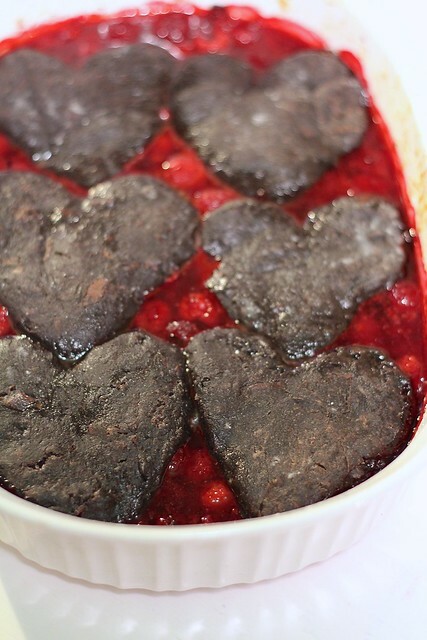 This is the perfect treat to whip up for that loved one in your life. Or, maybe just for yourself! Preheat the oven to 425ºF. Lightly grease a 2 to 2.5 quart baking dish. In the dish, combine the raspberries, sugar, cornstarch, lemon juice and vanilla. Fold together gently with a spatula until evenly mixed. Transfer to the oven and bake 10 minutes without the topping. Meanwhile, make the biscuits. In a medium bowl, combine the flour, cocoa, sugar, and salt. Whisk to blend. Toss the butter pieces in with the dry ingredients until coated. Cut the butter into the dry ingredients with a pastry blender or two knives until the mixture is crumbly and the largest butter pieces are the size of small peas. Stir in the buttermilk and mix gently with a fork until a dough begins to form. Knead together gently, just until the dry ingredients are incorporated. Gently fold in the chopped chocolate. Turn the dough out onto a lightly floured surface and pat down into an even layer about 1 inch thick. Use a cookie cutter to cut out heart-shaped biscuits, re-rolling dough scraps if needed. Add the biscuits to the warmed fruit and return the baking dish to the oven. Bake about 15-20 minutes more, until the fruit mixture is bubbling and the biscuits are just set and baked through. Serve warm, with vanilla ice cream or whipped cream.